Each pack contains 2 carrier sheets. A carrier sheet is for cutting anything that doesn't have a release liner. For cutting paper and card stock the blade must cut all the way through the material. To accomplish this without damaging the Teflon strip below, the Craft ROBO Pro needs to be used with the patented Graphtec carrier sheet. 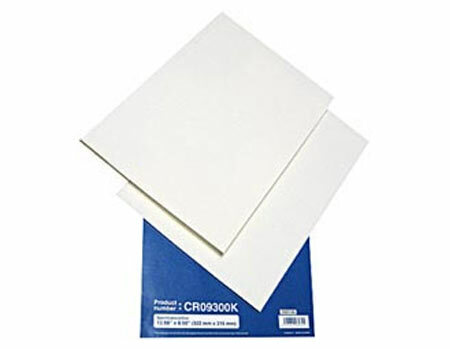 The user places paper or card stock on the carrier sheet (which is coated with a low tack adhesive) to hold it in place. This enables the user to cut without damaging or scarring the cutter protection strip below. Vinyl cutters are typically designed to cut only media (vinyl) with a release liner. The cutter blade cuts through the top layer of the vinyl and adhesive but does not cut all the way through penetrating the liner. If the blade were to cut through the liner it would eventually damage to the Teflon strip below. The strip would become scarred and uneven and there would no longer be a flat surface under the vinyl. This would make the depth of the cuts inconsistent.